Last week we were building on our subtraction knowledge and working towards choosing the best strategy for a particular question. We learnt how to take 9, 19 and 29 away from a number. We take 10, 20 or 30 away first because this is easy but then we have to add one back on because we have taken one too many away. 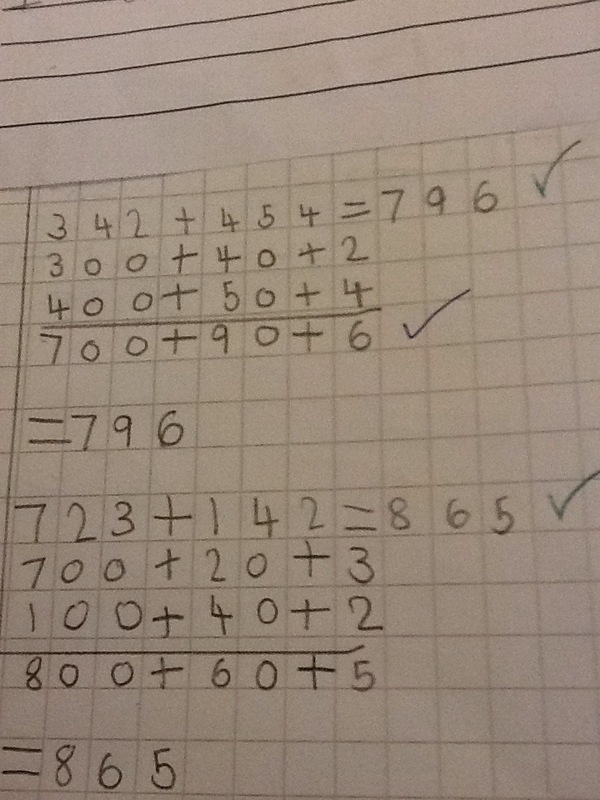 The children were working this out on number lines. We then became reacquainted with Popstar Ken, our maths frog. He helps us to subtract by counting up to find the difference between two numbers. He starts at the small number, gets to the next multiple of 10 and then carries on hopping till he gets to the bigger number. His hops are then added together and this is the difference between the two numbers. This week in maths we are starting to learn expanded column method-see picture below. Dragons are still lurking about in year 3. We’ve been thinking about Thunder dragons, what might they look like, eat and where might they be found? The children made a plan last week and this week will write their own non chronological report about them. In our project ‘Light and dark’ we made some fantastic, informative posters about why it is important to wear reflective and fluorescent clothes when you are outside in the dark. We also had lots of fun working with pastels and chalk making some beautiful light and dark scenes.